Mayor Ras J. Baraka today sent a letter to members of the NJ Urban Mayors’ Association asking them to join him in seeking to strengthen the social justice and home rule provisions of legislation pending in the state legislature to legalize adult use of cannabis. “As the New Jersey Legislature seemingly hurtles toward the legalization of cannabis for adult use, there remain serious issues of social justice and equity; municipal self-determination and finances that are not adequately addressed in the pending legislation. Assemblyman Jamel Holley’s proposed legislation makes major strides in dealing with social justice concerns and provides a solid framework for dealing with the remaining issues. While I support legalization, I can only support legislation that goes even farther to remedy the damage to communities of color caused by years of cannabis prohibition. 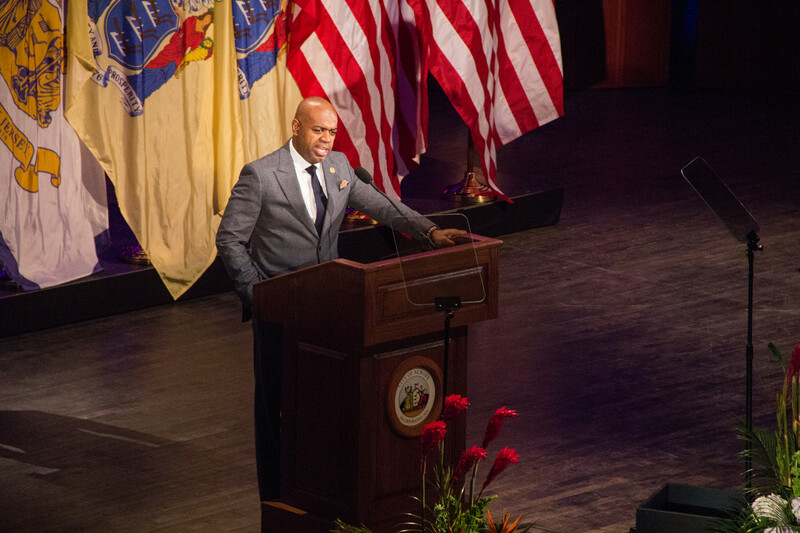 I urge you to join me in seeking passage of stronger legislation,” Mayor Baraka said. Mayor Baraka is asking the legislature to strengthen social justice provisions regarding expungement of cannabis convictions, release of those jailed for cannabis convictions, licensing of those with prior cannabis convictions, and licensing within Social Impact Zones. As the New Jersey Legislature seemingly hurtles toward the legalization of cannabis for adult use, there remain serious issues of social justice and equity; municipal self-determination and finances that are not adequately addressed in the pending legislation. Assemblyman Jamel Holley’s proposed legislation makes major strides in dealing with social justice concerns and provides a solid framework for dealing with the remaining issues. While I support legalization, I can only support legislation that goes even farther to remedy the damage to communities of color caused by years of cannabis prohibition. I urge you to join me in seeking passage of stronger legislation. Expungement. Persons convicted of possession or distribution of any quantity of cannabis should be eligible to have their records expunged without limit. It is illogical and unfair to continue to penalize people for the same behavior that we are now authorizing as a legal business. Release from Jail. By the same principle, anyone presently jailed for possession or distribution of any quantity should be immediately released from imprisonment. Licensing Requirements. Those convicted of possession or distribution of any quantity of cannabis should be eligible for a license. With the end of prohibition, bootleggers were allowed to become producers and distributors of alcoholic beverages. Just as America once recognized that prohibition of alcoholic beverages was a mistake, we must now recognize that prohibition of cannabis is a mistake and not continue to punish the victims of that mistake. Impact Zones. Social Impact Zones to compensate the people whose areas have been damaged by the marijuana prohibition is a necessary idea. But the concept needs teeth lacking in proposed legislation. All licenses in those zones should be reserved for residents of those zones, and programs should be mandated and funded in those zones to train residents in the financing and operation of a cannabis business. In Newark, we are already developing a program to help local residents interested in becoming involved in the cannabis industry. Racial disparities in cannabis law enforcement are intolerable, yet those disparities have persisted for generations. In New Jersey people of color are arrested for cannabis at a rate three times higher than whites. Cannabis prohibition has done serious damage to communities of color- taking parents away from their children, creating criminal records, preventing people from getting jobs and supporting their families. Half-way measures to correct a major social and racial inequity are not acceptable. Municipalities and not state regulators should have the authority to issue licenses or decide to prohibit licenses, decide how many licenses are appropriate for their municipality and determine where dispensaries, growing and processing facilities should be located. Local governing bodies are best equipped to reflect the will of their constituents. Five percent of the state tax revenues generated within a municipality by legalization should go directly to that municipality for programs related to cannabis enforcement, regulation, education and aiding the establishment of local cannabis businesses. The estimated $305 million in tax revenue also should make its way back to participating cities in part unrestricted to further investments in workforce development and training opportunities for youth and young adults, mental health and trauma care and the preservation of affordable housing. I ask you to join me and your fellow urban mayors in petitioning the legislature to not rush passage of cannabis legislation, but rather to take the time necessary to produce a law that will adequately deal with issues of social justice and home rule.